“Run that by me again Sarge,” Randall asked. “Right… Maybe some vampires and werewolves too?” Randall said with a smile. Sarge scowled and said “Be serious. 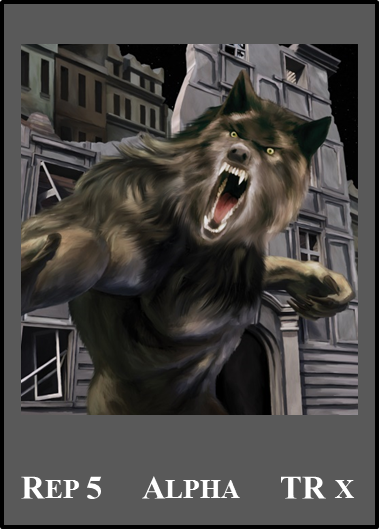 Although there have been reports of werewolves; vampires? Really; vampires? Now grab Wilks and let’s go”. 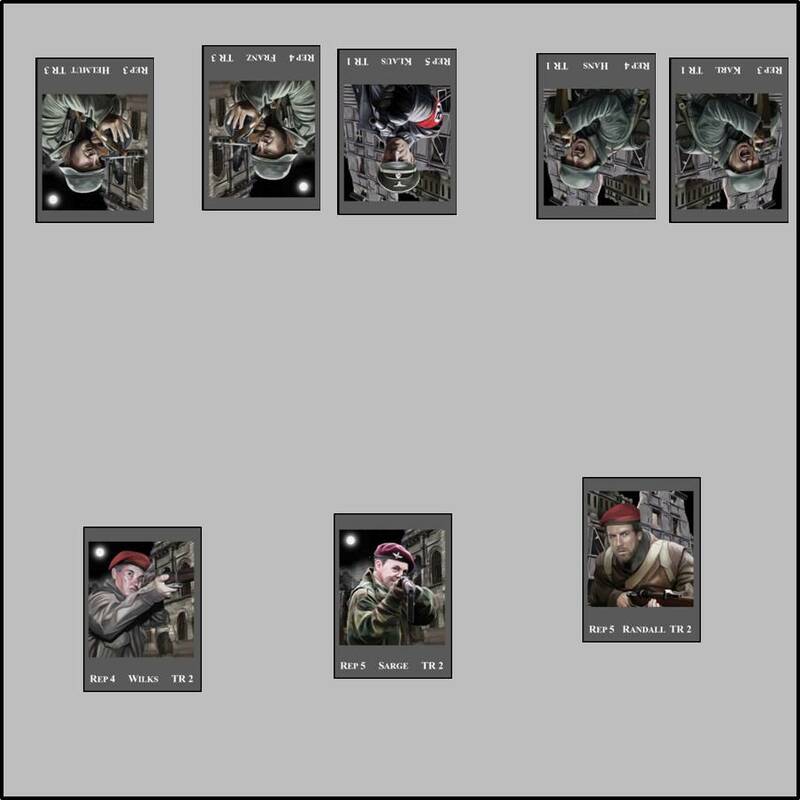 Here's a look at some of the cards included in the game. You can use minis if you want. 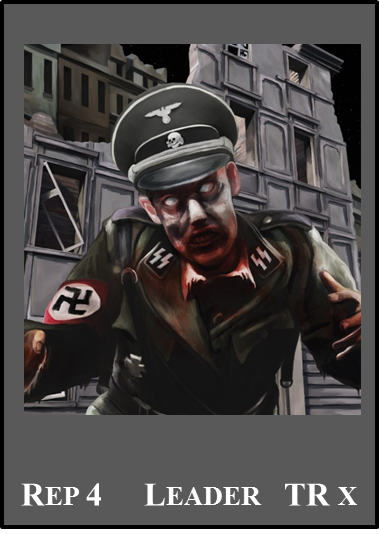 I have 21 days to complete the Campaign – find Herr Doktor and destroy his laboratory. 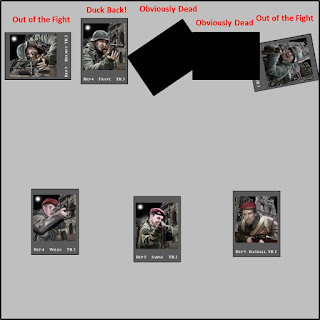 Here’s a quick AAR of my first Mission of WWZ. It’s a Raid and will burn up one day of time. Each Mission you can resolve up to 3 Contacts – a chance to run into someone or something. 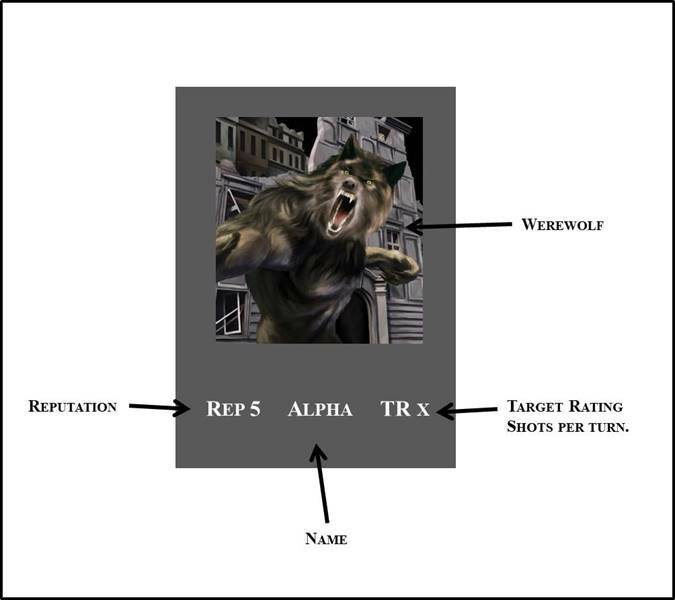 I roll 2d6 versus the Contact number of 5 – the Campaign starts out with a high chance of Contact – and score a 1 and 1. As each d6 is equal or lower than the Contact number, I pass 2d6. Looking on the Contact Table I see there’s been contact. Something new on the table – I add the scores of the passed d6 (2) and it tells me how many I have run into – two more than my group (3) so five characters. One less table to roll on! Missions are either in the City or in the Lab. I roll 1d6 and add the result (6) to the Contact number to see what I have run into. Uh, oh – 5 German soldiers. 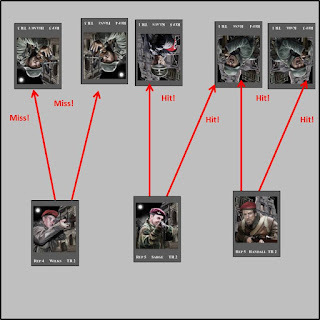 As there’s only 5 German soldier cards no need to randomly draw for them. I set up the fight on a 12" x 12" table space. I’ve just run into 5 German soldiers, but who was moving and who was in cover? I roll 1d6 on the Action Table. 1, 2 or 3 I have the Advantage – am stationary and in cover. 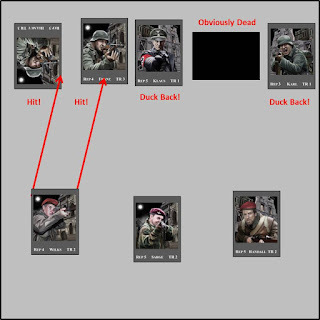 4, 5 or 6 and they have the Advantage – they are stationary and in cover. Note that after the first round of firing, ALL characters are considered to be in cover. I score a 2. I have the Advantage. 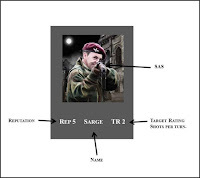 I now roll 2d6 versus Sarge’s Rep of 5 and pass 2d6. Klaus, the German Leader rolls 2d6 and also passes 2d6. Looking on the Action Table the side with the Advantage acts first – I open fire. Each of my soldiers have a TR of 2 so can fire two shots. I split them up as shown and roll 2d6 versus Rep.
As no terrain is needed the placement of the cards tells the story. 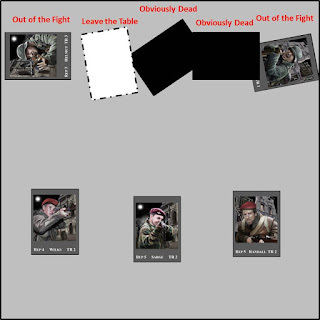 · If you’re ready to fight, place the card with its head towards the enemy so the player can read its info. · Placing the card with the bottom facing the enemy means it’s in Duck Back – can’t see or be seen. · Lay the card sideways and it’s Out of the Fight. · Place it face down and its Obviously Dead. 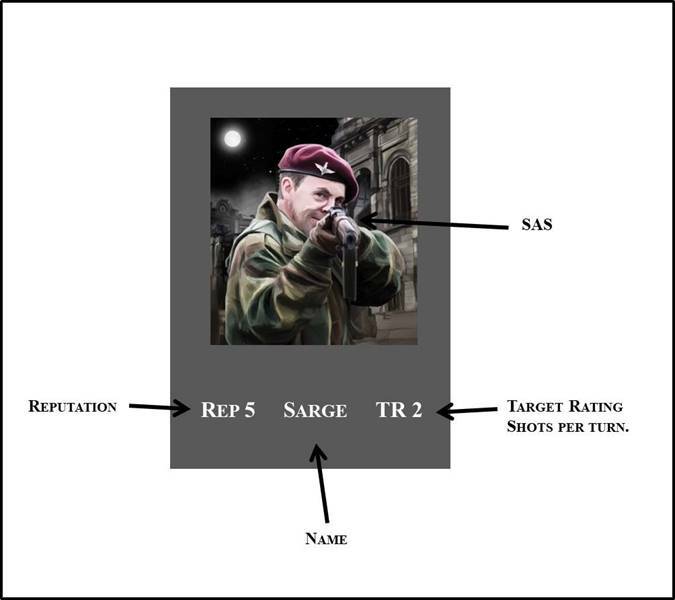 Here's what happens after the first round of SAS fire. Note that the two Germans that were missed can immediately return fire on the soldier that shot at them. They do. And miss. The soldier fired on can now return fire and scores 2 hits. Damage is taken, one Out of the Fight and one Duck Back. As all firing is done, both active and return fire, both sides take the Will to Fight Test. Both sides pass. The Germans are now active and spend their turn recovering from Duck Back. They are now in sight and can see and be seen. However, recovering takes up their whole turn. It's now the SAS turn and they fire. Here are the results. Note the placement of the cards. Again, no need for terrain. The fight is over and there are two German soldiers left Out of the Fight. 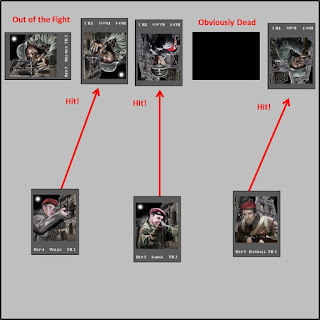 These are captured and interrogated on the spot. Neither soldier provides any info. Now what to do with them? We'll quit the Mission, take them back to HQ and reap the benefits. Each captured German soldier returned drops the Contact number by 1 so it's now 3, the lowest it can be. The Mission wasn't a success as I didn't resolve all 3 Contact, but reducing the Contact number to 3 was worth it. Download the free PDF found here to add Mechs to your Hammer & Anvil Games. 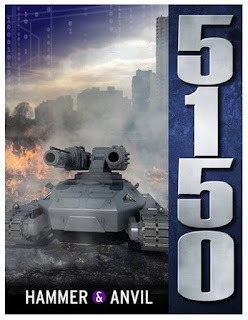 5150: Hammer & Anvil - Now on Sale! 5150: Hammer & Anvil can be played in a variety of ways: • You can play as a Tank Commander with one vehicle. 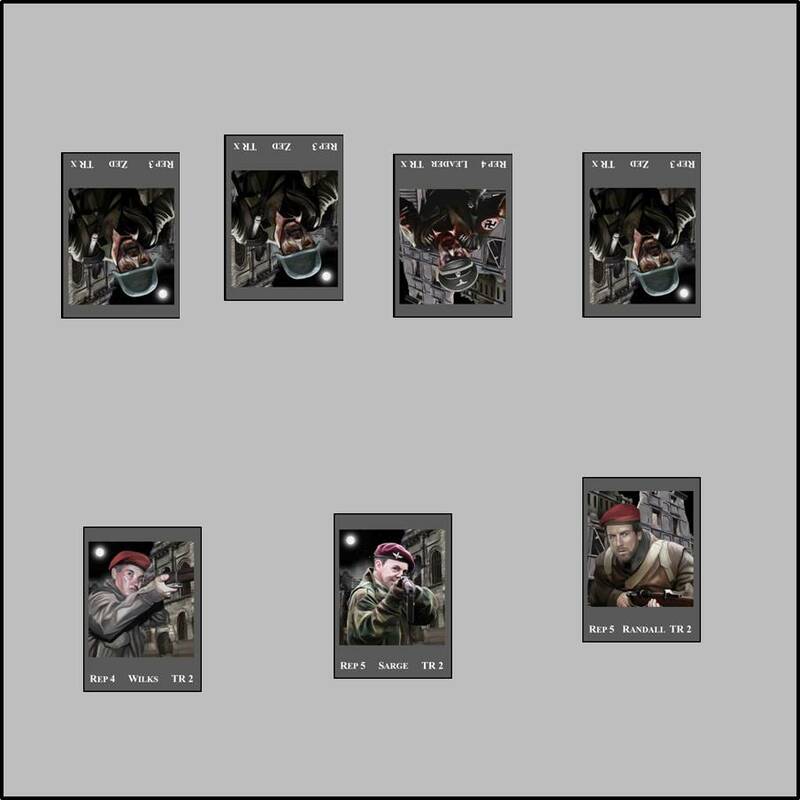 • You can play as a Platoon Leader with a platoon of 3 - 5 vehicles. 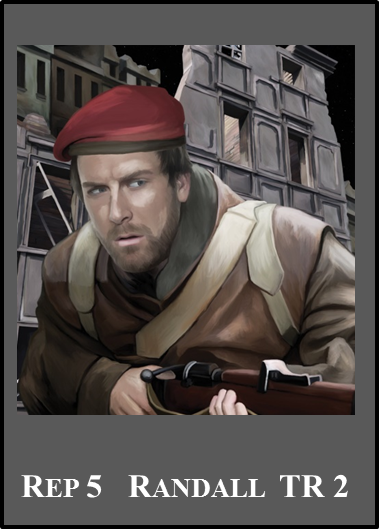 • You can play as a Company Commander with 2 or more platoons. • You can play a full campaign with up to ten scenarios. Play Miniature Games without Minis?! Part 3 - 5150: Hammer & Anvil...Uh oh! Activation dice are rolled for turn 2 and the PEF can move first. The 6 on my score means I won't be moving this turn, but I can react so no worries. The PEF rolls for movement and comes over the hill and into LOS onto my flank. But this high tech stuff allows for a 360 degree In Sight so we will roll off if the PEF is resolved as enemy. I roll 3d6 to resolve it and it's resolved as two Hishen HE 6 Heavy Tanks. The Hishen win the In Sight and open fire on my Thunder 1B on the left. With an APR of 13 and my side armor of 2 it's no contest if they score a hit. Both do and my tank blows up. 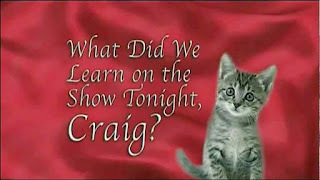 I take a Friend Brewed Up Test and continue on. I whip my two tanks around to face the enemy and we roll In Sights. I win and we open fire...and the error of my ways becomes obvious. My Armor Piercing Rating is 10. The Hishen frontal armor is 11. I can't penetrate their armor and must try Hands of Fate shots. When your APR can't penetrate you can still fire, but you have to roll "snake eyes" to hit and penetrate. Fat F&*^#ing Chance. Clank and clank. I still have movement left and slam the tanks into reverse, but can't get out of sight. The Hishen activate and active fire as I am already in sight. Two hits and both tanks are disabled. Luckily the crews can now bail and we run off the field. KNOW YOUR ENEMY! I wrote the damn rules, but didn't take the time to learn them. Yes, if you get approached from the flank or rear you still get an In Sight, but you're also presenting your weakest armor! My tanks had no chance in a fair fight with the Hishen Heavies. As soon as I activated I should have run for it instead of whipping around and firing. Here's how I make the counters for my own use as seen in Hammer & Anvil. I use card stock/poster board. 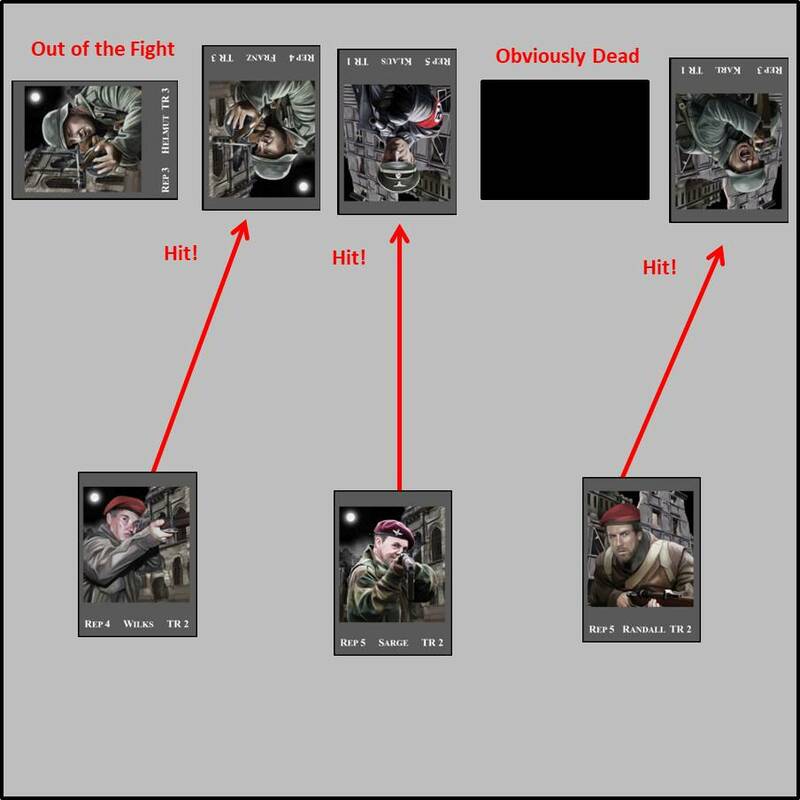 Here's more info on putting them together after they are finished. The ones found in our books are professionally put together. 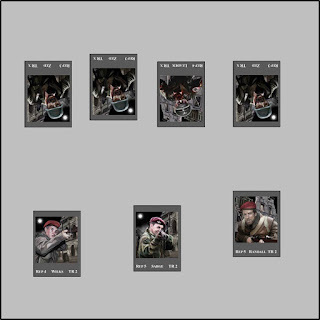 Here's a sample of the counters and how they have all applicable stats. I will be using a platoon of 3 Thunder 1B light tanks on a Patrol Mission. It is the first of the 10 Missions Hammer & Anvil; a Campaign versus the Hishen. Before the activation dice are rolled for the first turn I enter the table. It's been divided into 9 equal sections. I choose to enter through section 8 and move full speed into section 5. 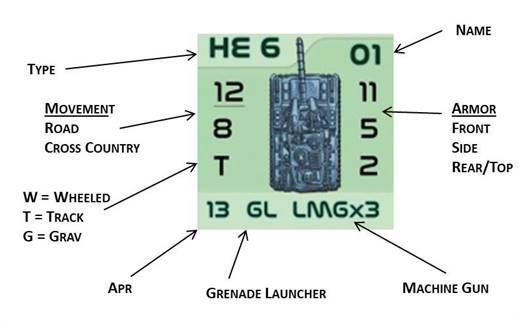 I then roll to deploy the three Possible Enemy Forces (PEFs) and score a 3, 4 and 6. The next closest PEF is in section 4 and behind a hill. Out of LOS means it isn't resolved yet. The third PEF, the orange one in section 3, is within LOS so is resolved. I pass 2d6 and there's contact. It is revealed as 1 HE 5 Hishen Armor Personnel Carrier (APC). 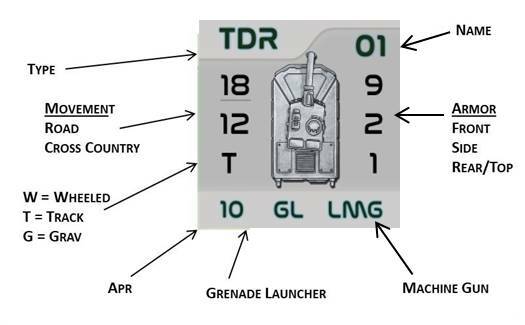 The APC is destroyed, I mark it with a counter, and that ends the Deployment Phase. I roll activation and win (the Blue d6 is higher). On a Patrol my objective is to spend one turn within 6" of the table edge in sections 1, 2 and 3. Activating first, my platoon moves into section 2. The enemy PEF rolls for movement and moves towards my flank. I'm not too worried as one major difference in Hammer & Anvil to Hell Hath No Fury, our WW2 vehicles rules set, is the In Sight Test. 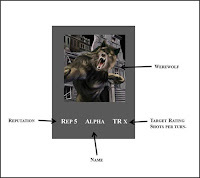 In HHNF the In Sight is only taken if you can see the target to your front 180 degrees. Due to then higher tech of the sci-fi rules, radar and similar allows for a 360 degree In Sight. So even if the PEF comes over the hill onto my flank, I will still get an In Sight. Play Miniatures Games without Minis?! Yep! THW games are playable with minis, but what if you don’t have any or want to try a new period without spending a lot of time or money buying and painting new ones? Many of our 5150 titles include card stock color counters. 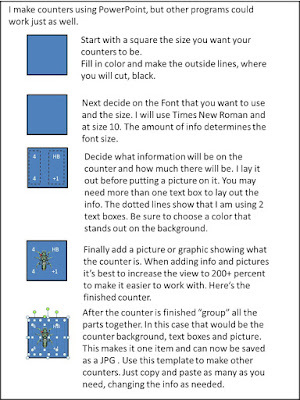 You can play with them as they are or if you want, as I do, use this simple and easy way to enhance these counters. These are for the upcoming 5150: Hammer & Anvil. A standalone compatible game for vehicle combat in the 5150 universe. These are a bit different than our previous counters as all the stats for all the vehicles are printed on the counters. We'll be doing this going forward with our new games. Now let’s get started. Here's the card stock sheet of forty 1" counters for Hammer & Anvil. 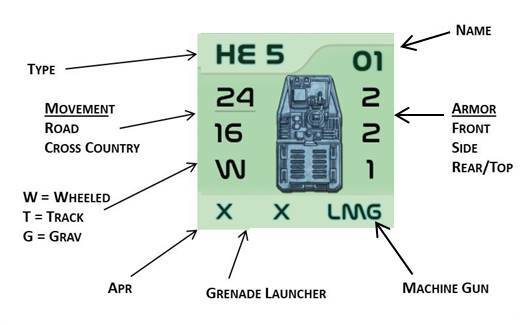 Each counter includes the type, name, movement rates, Armor Piercing Rating of its main gun, any machine guns it may have, and frontal, side and rear Armor Value. This stops you from having to refer to the book for vehicle stats. First you cut the counters out. I use a paper cutter for the rows, but scissors works great. Next I will be mounting them on 1", thick, mounting tape. I got mine at Amazon for less than $5, but you can find it at office stores and other places. 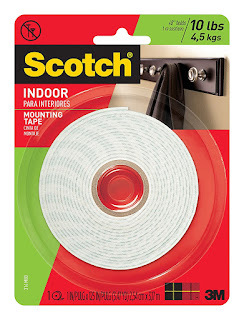 This gives them more weight and durability. Here are all the counters mounted and ready to go. 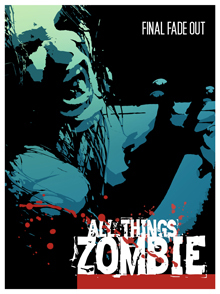 Here they are on an All Things Zombie board game map. You can use board games if you have them, but I use mine on a table with terrain. 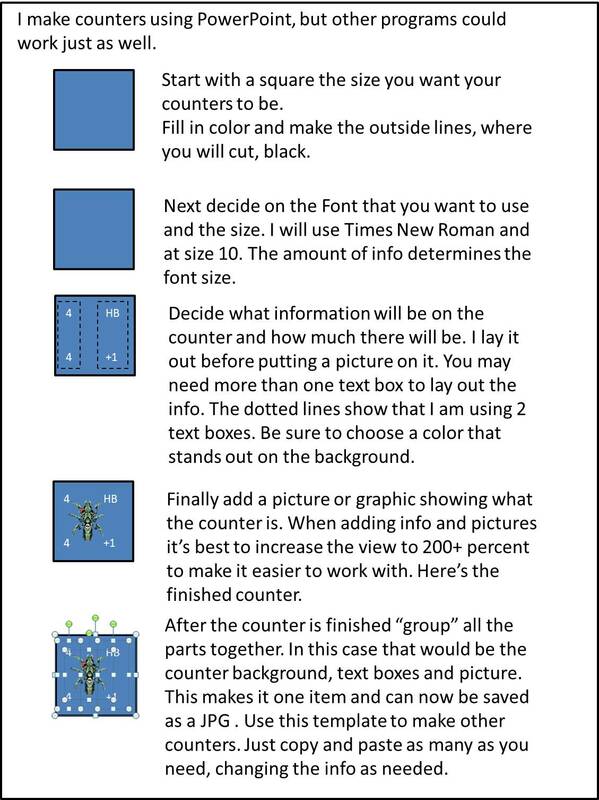 More info on making the counters. Here's another way we'll be offering our games to be played without minis. 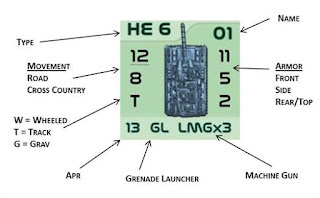 ATZ Review Lays things out in an easy to understand way. Take a look! 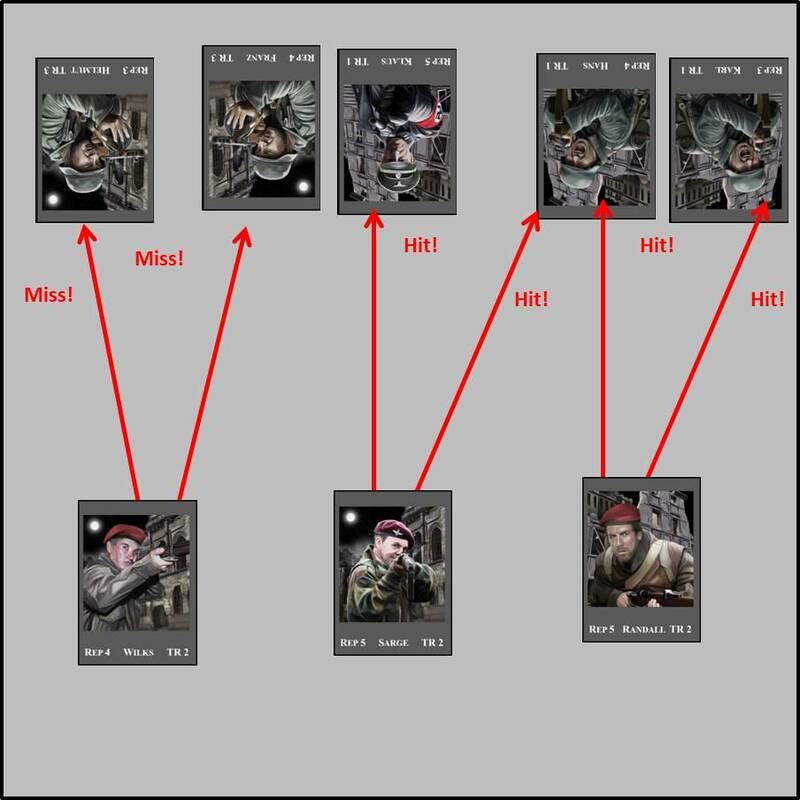 Weird War Zed - Where are the minis? 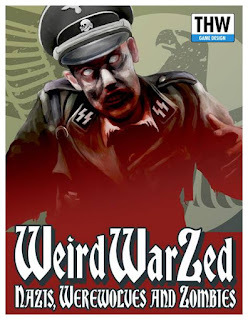 Weird War Zed is a quick to play and easy to learn, yet challenging, game. It's about a Special Air Service (SAS) section on a Mission to find and capture/kill the brilliant, but twisted, German Scientist - Herr Doktor. 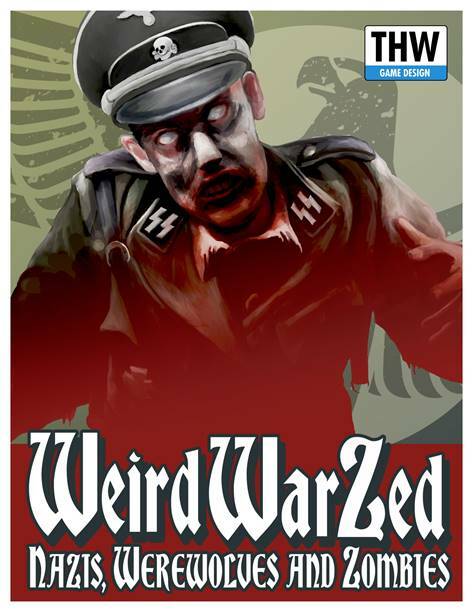 Along the way you'll run into German Soldiers, Zombies, and Werewolves. But what you won't run into are miniatures and terrain pieces. Instead of miniatures we use color Poker size playing cards. This gets you into the game quickly, doesn't cost as much as using minis, and can be played on a small space. Want to use minis? You sure can and there are lots of manufacturers out there, starting with Rebel Minis, makers of fine 15mm figures. 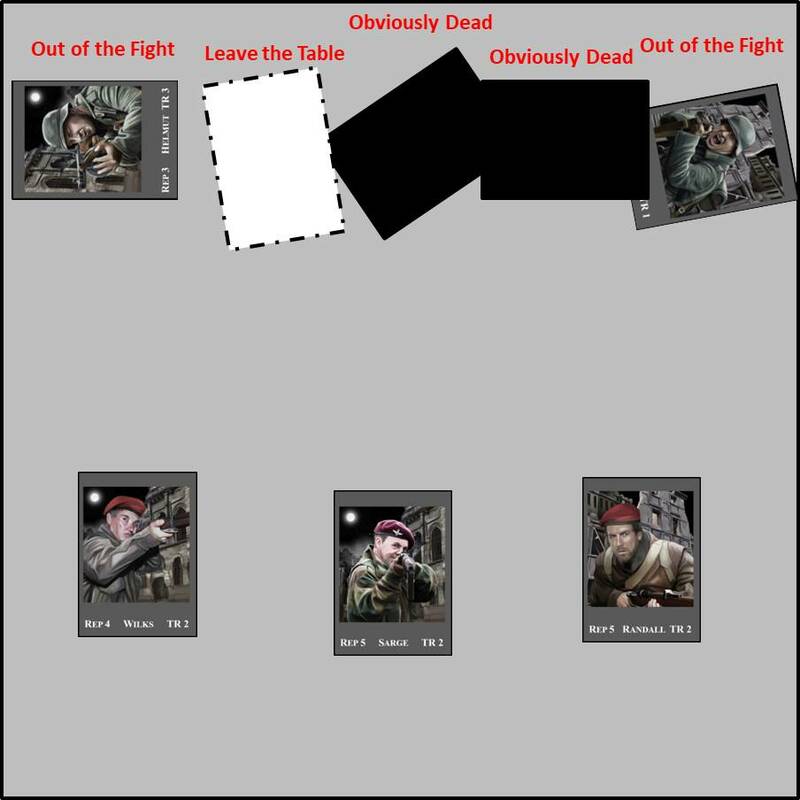 Here's a sample fight on a 12" x 12" space using the cards found in Weird War Zed. The way the game is set up you'll never have more than 8 cards/minis on the table fighting at the same time.